Watch Sensear's two way radio headset enable clear communication in a noisy food manufacturing environment. Watch Sensear's Smart Group headset being used in a plant tour. Plant tour leaders can continue to communicate with workers taking the tour by using the Smart Group headset's built in short range radio. Watch Sensear's hearing protection being used by miners in a copper ore grinding operation. SENS technology enables workers to communicate in noisy environments while still protecting their hearing at the same time. Watch Sensear's electronic hearing protection being used by a tree surgeon. 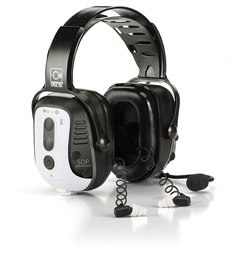 Workers can communicate using the electronic hearing protection's bluetooth capability while protecting their hearing at the same time. The coaches and analysts of Hockey Australia uses Sensear in order to effectively communicate between one another at major sporting events. Industrial Protective Products in Western Australia explains the benefits Sensear brings to it's business and the potential for growth within the oil and gas and mining markets. Sensear is proud to go to market through some of the worlds leading Safety Distributors. In Brazil, Sensear has developed a strong relationship with SP Equipmentos, Brazils leading Safety Distributor to address high noise communication problems of many of their customers. Without the built in short range FM radio functionality of Sensear’s SM1xSR and a throat microphone attachment, these paving company workers would take far longer to do their job and would struggle to communicate as effectively in this highly dangerous and noisy environment. Communicating effectively and staying protected in high noise environments can be problematic. RKD Tree Service is a typical example of how high noise effects productivity and worker safety and how Sensear is solving this common problem. Workers performing maintenance procedures on a bank's HVAC system won't miss important cell phone calls and can continue to communicate uninterrupted using the SM1x's Bluetooth capability. SENS™ technology enables communication via cell phone even in a high noise environment. Workers are staying protected while continue to communicate effectively in a noisy coal fired power plant by integrating the Sensear SM1xSR into their existing two way radio system. Airline employees needed to be able to safely and effectively communicate while on the tarmac. Now with Senear's innovative SENS™ (speech enhancement, noise suppression) technology, they are able to hear speech and stay protected. This crew required the ability to communicate clearly and effectively while on an airboat. Sensear's SENS™ technology provided them with the solution. Employees working in high noise environments in excess of 96dB can still communicate effectively in a dairy engine room using the short range radio functionality on Sensear's SM1xSR. This fire rescue crew needed to be able to communicate in noise levels above 98dB. Sensear's SM1xSR allows the fire rescue crew to hear speech and stay protected with its innovative SENS technology. Trying to teach young graduates in a high noise environment was not only difficult but incredibly inefficient. With Sensear's innovative SENS™ technology, students and instructors can now hear speech and stay protected in high noise learning environments. Safely and effectively communicating on construction job-sites with noise levels in excess of 102dB was impossible. Now with Senear's innovative SENS™ (speech enhancement, noise suppression) technology, they are able to hear speech and stay protected. Workers can continue to communicate effectively in environments where intrinsically safe hearing protection is required with Sensear's SM1xSR (IS) device. Sensear's SM1x provides workers with the means to communicate safely and effectively in a hospital boiler room. By connecting a throat microphone and two-way radio to the Sensear Smart Ear Muff, work can continue safely and uninterrupted in a high noise environment. Sensear's SM1x provides a viable hearing protection solution for workers with hearing loss. Workers operating a maintenance vehicle can continue to carry out tasks efficiently and safely in high noise environments through Sensear's speech enhancement and noise reduction technology.